State government of uttar pradesh has announced the launching date of most awaited government pension scheme of uttar pradesh. Chief Minister of uttar pradesh will launch this Samajwadi pension Yojana on 5 November 2014. Government will organize a ceremony in janeshvar Mishra park in Lucknow to start this pension Yojana. 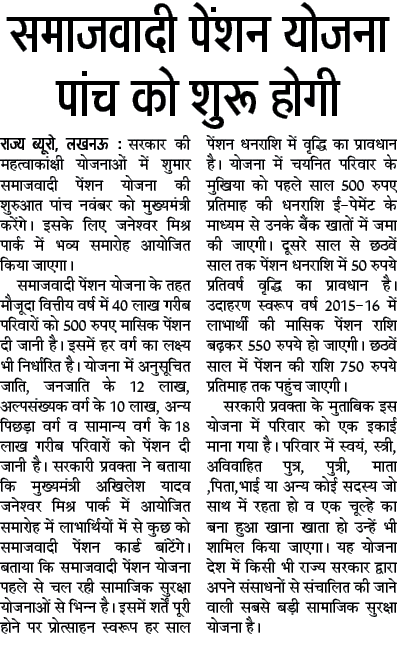 Government decided to give 500 res per month pension to 40 lakh poor families of uttar pradesh. All category of Uttar pradesh are selected for Samajwadi pension Yojana. Government decided a target to provide the pension category wise. Total 12 lakh families will be selected from SC /ST category, 10 lakh Families will be selected from OBC families, and 18 lakh families will be selected from general category. This information is given by a government officer of uttar pradesh. Government will distribute Samajwadi pension card on 5 November 2014 to selected beneficiary. Government already continuing another scheme named Samajik Suraksha Yojana but this is scheme is little bit different with Samajwadi pension Yojana. If candidates will hold all the eligibility criteria for Samajwadi pension Yojana then government will increased the pension per year as encouragement bonus. Selected families will get there pension via E payment in there bank account. In first year of this scheme, each family will get rs 500 per month pension. After that in 2nd year of the pension scheme government will increase rs 50 per month pension till the 6th years. That mean if you are getting rs 500 per month pension in 2014-2015 then you will get 550 in 2015 -2016 . Only individual family will be consider as Unit and this unit will get this pension. This is the really very appreciable government scheme of uttar pradesh which is fully found government scheme by state government of UP and this scheme is one of the largest financial covering government pension which will provide pension to 40 Lakh families in first phase.